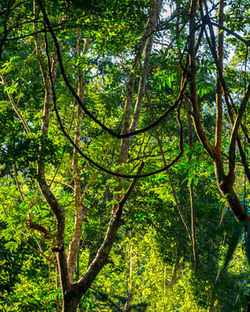 Tour the Amazon Rainforest near Santarem, ride down the Tapajos River, visit Alter-do-Chão, the National Forest of Tapajos (FLONA), Fordlandia, hike in the Amazon jungle and view some of the largest trees in the world! DAY 1. Arrival to Santarem – staying the night at ZIB. By boat or by airplane, any trip is exhausting. Even the toughest people first need a cool bath, a nice place to sleep and time to relax and get used to the place. Zero Impact Brazil built huts at our show room in Santarem. Here you’ll have a place to hang a hammock, have a good shower, do laundry if needed, and find plenty of useful information. It is at this facility that you are going to learn about different species of wood, see the organic garden built by our boss Rick Paid, and grab a couple of good books to read while taking a rest in your hammock. Boats on the Tapajos River in Santarem. DAY 2. The boat trip starts. Our facility in Santarem is placed in a very nice position – it is not only close to the airport, it’s only 5 minutes from Juá Beach – the first beach you will see during your journey. It is at Juá that the boat will be waiting for us to start your river adventure. The Tapajos River is one of the nicest in the world for navigation – hundreds of kilometers of white sandy beaches, breathtaking landscapes and, of course, some of the most wonderful Jungle scenery in the world. Our first stop will be Alter-do-Chão, the “Brazilian Caribbean.” Ranked among the Top-100 beaches in the world, and the most beautiful freshwater beach in Brazil. That’s where our boat will stay for the night and you will be able to play with pink river dolphins, watch the birds and take a swim while watching the spectacular sunset at Cururu point. DAY 3. We go to the National Forest of Tapajos (FLONA). It’s one of the biggest natural parks in the world, supported by the U.S. Forest Service, World Bank and several other international organizations. Our aim is to visit the community of Maguary and meet the families that still have their livelihood based on rubber tree products. This is your chance to buy some real Amazonian hand-made products made of natural rubber. Then the boat will continue ahead and make a non-stop trip to Fordlandia. DAY 4. Not too many people have heard about the wish of Henry Ford to build an American dream in the middle of the Amazon back in 1928, but that’s what happened. Ford Motor Company hoped to secure a source for rubber for automobile tires, but the plan was a total failure. Fordlandia is now a ghost village, overtaken by the jungle from what almost 90 years ago was a typical North American town, 300 km from Santarem. Fordlandia remains preserved along with many of its secrets. The bridge across the swimming hole. DAY 5. We are now on our way back down the river, but this time there will be a van that will pick up the adventurers close to the boundaries of Tapajos National Forest. We are heading to 766, the natural reserve of 766 hectares that belongs to Zero Impact Brazil. We make our way through soy fields and small farms until we arrive at the property of a small family of manioc producers. After learning from them how to make manioc flour and open a jack fruit, we leave the transport behind and enter ZIB property. After about a ten minute walk, we arrive at a small wooden cabin that will be our headquarters. Of course, the long trip from Fordlandia will not allow us to go hiking today; first we need to relax. What can be better than a refreshing swim in the cold, crystal-clear water of the river, just one minute away from the cabin? We have built a small dock with a rope swing, so that everyone can have fun jumping into the swimming hole. In the evening we’ll have a barbeque and a briefing about the next 7 days of your jouney. Hiking under the giants of the Amazon rainforest. DAY 6 - 12. This is what we promised you by the name Big Tree Adventure Tours. Over the course of the next few days, expect to get dirty, wet, tired, and sometimes hungry chasing the wildlife and exploring the jungle and forestland around you. We have also created a couple of base camps on the lake that is deep in the forest, under some giant trees. It will allow us to sleep deep in the jungle and see the alligators, bats and lots of species that we will otherwise miss while walking and making noise. Staying quiet is the main factor if you want to see sloths, monkeys, parrots, toucans and more. And don’t forget, you may not see the animals, but when you are in the jungle there are thousands of eyes looking at you. Proper behavior will let them appear. A big part of the tour is the search for really big trees. You will be impressed by the variety of forms and colors and some of the trees are over 1000 years old. Many species are endangered and extremely rare. DAY 13. We arrive back in Santarem, and now you’ll be happy to see ZIB’s washing machine, the huts for hammocks and the internet! After you enjoy a good shower, everything will be ready for a goodbye party on Juá Beach, where we’ll set a fire and everyone will exchange stories about their adventures in the forest and down the river. DAY 14. This is our last day as BTAT explorers. If you have free time, you can go to downtown Santarem and take a look at the local hand-made gifts and products, have some açaí, take some photos from the spot where the Amazon and Tapajos Rivers meet and eat at one of the local restaurants. Well, this is it. Big Tree Adventure Tours is inviting you to a great expedition. Don’t miss your chance to experience it!